In recent years, Korg have combined the nostalgia for analogue synthesis with a desire to innovate. This article will provide a quick overview of their products, specifically the Korg Volca series. To my mind these units are exemplars of the Desktop Electronic music paradigm. The release of the Korg Monotron in 2010 marked a shift in thinking for a company famous for their electronic musical instruments. Indeed it was their first analogue synth in three decades. Running off two AAA batteries, this tiny plastic box came with a built-in speaker for quick auditioning. The stylophone-style contact keyboard made any precise pitch unlikely. The Monotron was designed for sound-making as play, rather than as "serious" musical activity. The filters were apparently based on the Korg MS-20, although the audio quality is such that it was hard to judge. In 2011 the Monotron Duo and Delay were added to the line-up. These devices are typical of a certain Korg thinking that aligns very well with DEM. Each instrument has obvious limitations, stemming from the cheap build, inexpensive price, and limited size. But they also have unexpected features that encourage flexible usage, especially in combination. With the Monotrons, this is reflected in the audio input jack, which allows external signals to be processed by the units (through filter and delay circuits). For this reason, I found the Monotron Delay to be the most compelling of the three models. I purchased it as a "stocking stuffer" and it ended up in a couple improvisations. Korg's revivalist impulse crystallised in 2013 with the Mini MS-20, a faithful replica of the original semi-modular monophonic synthesiser, albeit in a smaller form factor. In 2015 the Korg MS-20M Kit version followed, alongside their replica of the ARP Odyssey duophonic synthesizer. The fact that Korg re-issued another company's product is noteworthy. It demonstrates their commitment to the analogue aesthetic, which is as much about adopting certain working methods as it is about the resulting sound. New instruments followed in 2016 and 2017. First, the Korg Minilogue, a four-voice analogue synthesizer. Next, the Monologue, a monophonic version of the same, but with certain innovative features (e.g. micro-tuning) courtesy of co-designer Richard James (Aphex Twin). But for me, the Volcas are Korg's most intriguing releases. This series was introduced in 2013 with three instruments: Volca Keys, Volca Bass, and Volca Beats. As the names indicate, each was designed to be one component in a musical production. For this purpose, they have sync in and out ports on standard 3.5mm stereo cabling. These enable tempo and transport synchronisation. The units also have a DIN MIDI in port, though not MIDI out. To use with a computer or external gear, the usual method is to take a MIDI out to the first Volca, and then daisy-chain the remainder through the sync port. If you need MIDI input to several Volcas, a splitter cable before the first unit is the solution. These instruments are small (less than 20 by 12 cm) and battery powered (via 6 AA cells). Hence they meet the requirements of DEM, as previously defined. They are not so tiny as the Monotrons, but are much more capable as musical instruments. They are not so large as the synths with "proper" keybeds, but are less expensive and just as capable sonically. The first three Volcas were analogue synthesizers with a built-in contact keyboard and sequencer. They store only 8 patterns and there's no way to export these from the instrument. This reflects the positioning of the Volcas as easy devices for on-the-fly composition. Korg includes an excellent feature labelled "motion recording". This allows the automation of knob movements into a sequence, so that filter sweeps, volume changes, and the like can be saved. However, as there is no step recorder, such motions must be made in real-time. The small, tightly-packed knobs on these units make that tricky, but far from impossible. Another welcome feature is the ability to turn off any of the 16 steps in a bar, meaning that unorthodox time signatures are easily accomplished, and indeed may be varied in performance. This is an example of the unexpected flexibility I mentioned earlier. 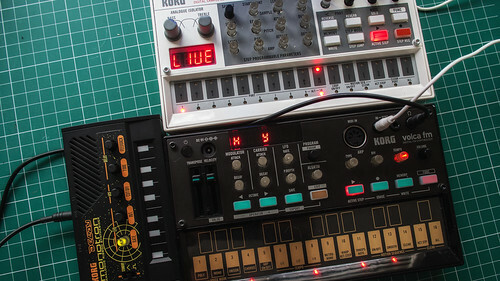 In 2014, Korg released the Volca Sample, which differs from the previous synths in being a digital sample player and sequencer. Indeed, it is a much more capable drum machine than the previous Volca, although the Beats will still entice those who prefer analogue sound generation. More on this product below. 2016 saw the arrival of Korg Volca FM, a full six-operator FM implementation, with three-voice polyphony. Not only is this a Yamaha DX7 in a tiny box, but it is fully compatible with original DX7 sound carts! Free software allows these to be edited and downloaded to the Volca. Truly amazing! Towards the end of 2016, the Korg Volca Kick was released. As the name indicates, this a kick drum generator, but it's not limited to percussion sounds. The analogue synthesis engine can also generate toned bass synth sounds. These innovative instruments, starting with the Monotron, were designed by Tatsuya Takahashi, who unfortunately left his position of Chief Engineer in 2017. So perhaps we shall see no further Volcas, even though quite a number of modules remain unavailable: mixer, FX unit, wave table synth, etc. My next article will look at the Volca Sample in more detail.